Manufacturing for this product has been discontinued. As an alternative, please refer to the B30, P747 and P74x relays. 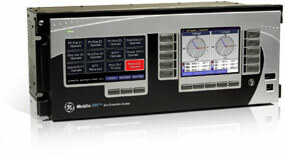 The Multilin™ B95Plus Bus Protection System is the ideal solution for one of the biggest challenges for large bus protection: the time and cost involved in the design, installation and commissioning of the field wiring between measurements from the switchyardand the bus protection relay in the room. The HardFiber Brick, the environmentally hardened distributed bay unit of the B95Plus bus protection relay, directly reduces the time and costs involved in field wiring in both the short term and the long term. Save time and money in the short term with flexible mounting options for the HardFiber Brick bay unit. The compact size and rugged design allows for installation in the switchyard, in equipment cabinets or in the control room. Data signals are converted to digital signals per the IEC 61850 standard and communicated over a single fiber optic cable. Installation next to the primary signal source virtually eliminates all field wiring. To save money in the long term, use the HardFiber Brick bay unit as an IEC 61850 process bus merging unit. 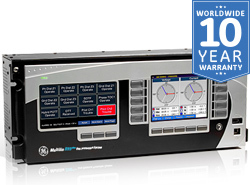 This becomes the complete I/O interface for protective relays and all zones of protection. Relay installation for any future zone of protection becomes plug-and-play: mount the relay on a panel, plug the relay into the HardFiber Brick bay unit and commission. The Multilin B95Plus Bus Protection System changes the focus of bus protection to that of application by replacing most of the field wiring with distributed I/O and fiber optic cables. 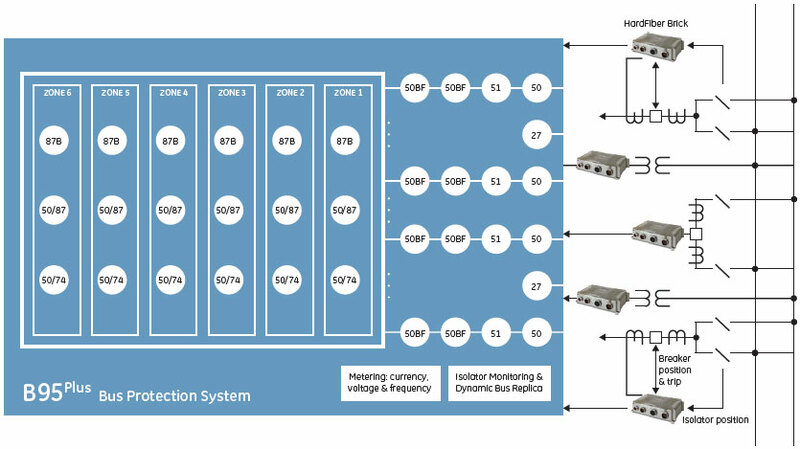 The bus protection system consists of a distributed process interface (data acquisition and tripping) architecture using HardFiber Bricks as bay units, with centralized processing performed by the B95Plus protection relay. All copper field wiring is between primary equipment in the switchyard and Bricks, which ideally should be located at the primary equipment in the switchyard. Fiber optic cables connect Bricks to the B95Plus. For all applications, the installation is then identical: the physical interface consists of Bricks connected to a fiber optic cable. A single B95Plus is mounted in a relay cabinet, with the process cards in the unit patched to the fiber optic cables coming from the Bricks. The HardFiber Brick System can easily be incrementally scaled to include new equipment as stations evolve. Duplicated Bricks in the switchyard provide a drastic improvement in reliability and security over today’s technology. The B95Plus bus protection relay unit is the heart of the system. This unit performs all processing functionality, including protection functions, metering, monitoring, FlexLogic and SCADA communications. 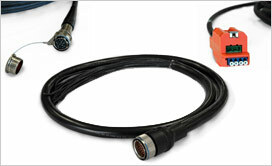 The HardFiber Brick uses connectorized cables to interface with primary equipment and with system measurements, and to interface to the B95Plus itself. The cables at the Brick end uses an IP67 certified industry standard connector designed for rugged environments. These connectors screw onto the Brick for a simple, tools-free connection. Three of the cables are copper cables used to acquire AC measurements, acquire equipment status, and provide equipment control. The fourth cable provides the fiber interface to the B95Plus central unit as well as DC power to the Brick. These cables therefore can become standard parts, manufactured in advance of installation by any cable manufacturer. These cables are also directly available from GE. Multi-zone differential protection with both restrained (dual-slope percent or biased) and unrestrained (unbiased or instantaneous) functions incorporated. Differential protection is fast (typical response time: 1 power system cycle) and secure. Security is achieved by using a fast and reliable CT saturation detection algorithm and a phase comparison operating principle. Security is further enhanced by support for redundant process interface units (Bricks). Supports both three-phase tripping and individual phase tripping. Dynamic bus replica functionality and multi-zone protection (up to 6 zones) is supported allowing application of the B95Plus to multi-section reconfigurable buses. A zone expansion/contraction to an open breaker feature is included. Isolator position monitoring for up to 48 isolators. Check-zone functionality configured by programming one of the differential zones to enclose the entire bus. Additional bus protection functions including end fault protection, breaker fail and overcurrent protection for each bus source, CT trouble monitoring for each bus zone. The B95Plus can be applied on a multitude of bus configurations due to the distributed architecture, and includes support for up to 6 zones of bus differential protection and support for up to 24 bus sources. 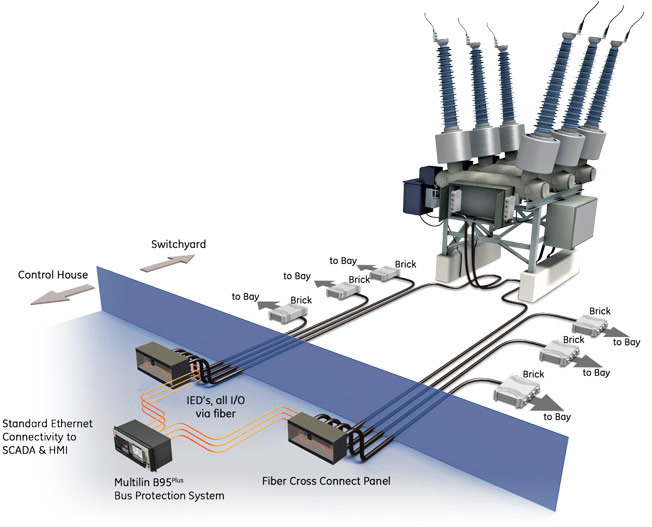 The physical connection and wiring architecture for the B95Plus system will be identical for any bus configuration: Bricks installed to acquire measurements and equipment status, with the B95Plus unit connected to Bricks via fiber optic cables. The relay panel design will be identical for all applications, for all bus configurations. The only difference from application to application is the number and location of Bricks, and the programming of the B95Plus unit. The B95Plus Bus Protection System is intended to operate as a standalone, distributed bus protection system. The bay units for this system are Bricks, part of the HardFiber IEC 61850 process bus solution. Once the Bricks for the B95Plus are installed process bus data is available for use for any other zone of protection. The Bricks, then, are a distributed I/O interface for all protection functions and zones, not just the B95Plus. With the B95Plus in place, installing line protection or feeder protection is a simple process: mount the relays in a panel, and patch to the fiber optic cable from the appropriate Bricks. The only requirement is the relays must implement the appropriate IEC 61850 datasets to interface successfully with the Bricks. All members of the Universal Relay family have the ability to interface with Bricks. Laser class Class 1. This product is eye-safe under all operating conditions. Enabling the energy transition, Grid Solutions serves customers globally with over 16,500 employees in approximately 80 countries. In today’s age of accelerating energy transition, the reliability, security and efficiency of the grid remain paramount. Grid Solutions helps enable utilities and industry to effectively manage electricity from the point of generation to the point of consumption.